I've had pretty terrible skin pretty much all of my teenage life and it's fair to say I've tried all sorts of products, so-called miracle cures and old wives tales in the hopes of clearing it up. Now, as I'm sure you can tell from the title - I still haven't found the cure, but, what I have found is a load of products that seem to be helping. My skin is smoother than it's ever been and generally just looks miles better. So, for today's post i thought we'd have a chat about all of the products I use as part of my morning skincare routine, and, next week, we'll do the same but for my evening skincare routine! Let's dive right in, shall we? My morning skincare routine is pretty simple and doesn't take long to complete at all. I start by washing my face with Dermalogica's Special Cleansing Gel*. It's really light and refreshing, and leaves my face feeling really clean. Following this, I'll use Dermalogica's Daily Microfoliant - which, can I say, I absolutely love. 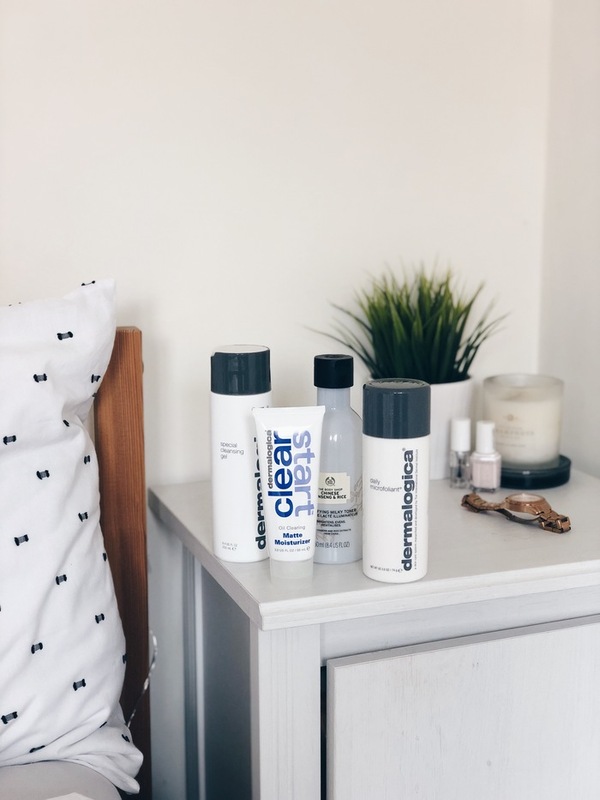 I was sent a selection of Dermalogica's products to try out, and even after just one use I knew this was going to be my favourite product of the lot. It's actually a white powder that turns into a scrub when it meets water, and is such a good exfoliant. It's not too harsh but definitely gets rid of a layer of dead skin cells or two - it's amazing. I then wait for my face to dry before using The Body Shop's Chinese Ginseng and Rice Toner. I apply a fair amount to a cotton pad and just tone my whole face with it. I've been using this for months and months now, and my face always feels really good after using it. The last step in this routine is a fairly new product addition. I have pretty oily skin - unsurprisingly, you know having acne and all that - and this moisturiser has been doing really good things for my skin. 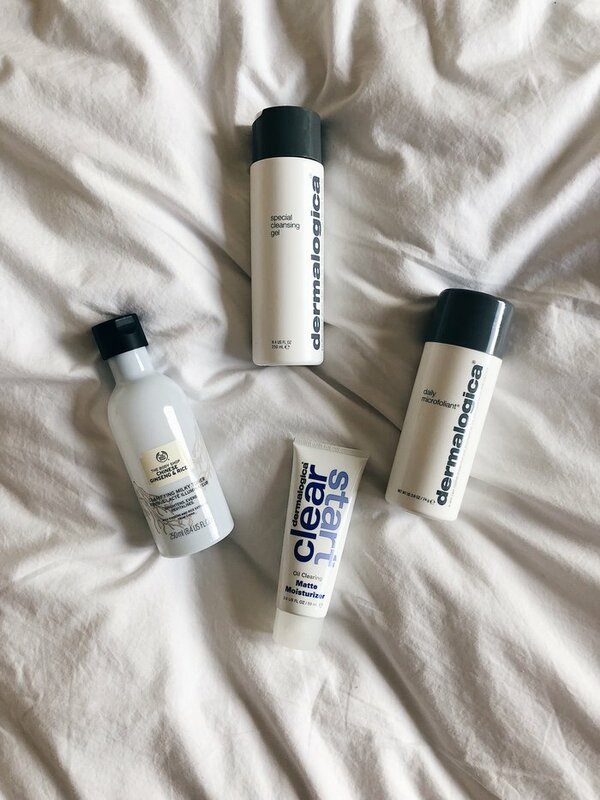 It's the Dermalogica Clear Start Matte Moisturiser*. It's really light on the skin, sinks in really quickly and contains SPF 15. Now, it certainly doesn't keep my skin matte all day, but it's by far one of the best oil control products I've used! Aaaaand there we have it, my morning skincare routine. As I said earlier, it's not the most complicated of routines but it's doing really good things for my skin currently! If you only try one of the products in this post I for sure recommend that it's the exfoliator - it's amazing! Now, I know this isn't the most affordable of skincare routines, but, having tried a lot of the high street teeange/acne products it's fair to say you definitely get what you pay for. What's your favourite product in your skincare routine? I've heard such amazing things about Dermalogica, I need to try it! I've never tried any Dermalogica products but I've heard so many people rave about them! I swear by anything Dermalogica and love a good toner so I'm definitely intrigued by the Body Shop one- I've never noticed it in there before! I'm so glad you've found so many products that work well for you! Dermalogica products are some of the best, thats for sure. I love their daily microexfoliant, such a gentle exfoliator and leaves the skin feeling so smooth! My favourite products are moisturizes as I have dry skin. My favourite skincare brand is Arbonne, I first used their acne line when my skin was constantly and badly breaking out. It really helped, I barely broke out when I was using it. I also love their sentive skin range as it’s all super nourishing. All of their products are also natural but therefore super pricey! I've heard so many great things about Dermalogica, I've never used them on myself but I used them on clients when I did beauty therapy! I agree that you definitely get what you pay for when it comes to skincare, it's worth paying more money.